The so-called militarization of police has become a major issue both in libertarian policy circles and in the civil rights community. Radley Balko has done yeoman’s work showing the harms, including outrageous civil liberty violations, generated by the use of military-grade armor and weapons, the rise of the SWAT team, and the intimidating clothing preferred by many modern police. 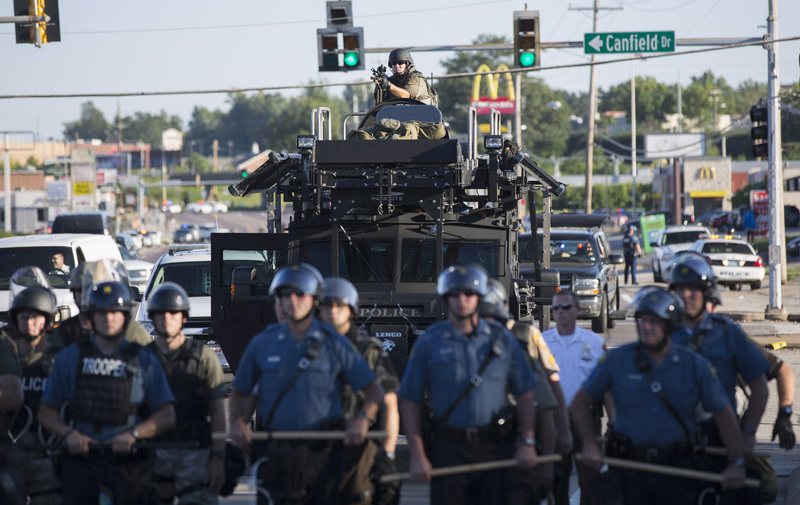 The photos of tanks on the streets of Ferguson were particularly galling. As a literal card-carrying member of the ACLU, you can imagine my own opinion about this trend. That said, the new issue of AEJ: Policy has two side-by-side papers – one from a group at the University of Tennessee, and one by researches at Warwick and NHH – that give quite shocking evidence about the effects of militarized police. They both use the “1033 Program”, where surplus military equipment was transferred to police departments, to investigate how military equipment affects crime, citizen complaints, violence by officers, and violence against police. Essentially, when the military has a surplus, such as when the changed a standard gun in 2006, the decommissioned supplies are given to centers located across the country which then send those out to police departments within a few weeks. The application forms are short and straightforward, and are not terribly competitive. About 30 percent of the distributions are things like vests, clothing and first aid kits, while the rest is more tactical: guns, drones, vehicles, and so on. Causal identification is, of course, a worry here: places that ask for military equipment are obviously unusual. The two papers use rather different identification strategies. The Tennessee paper uses the distance to a distribution center as an instrument, since the military wants to reduce the cost of decommissioning and hence prefers closer departments. Therefore, a first-stage IV will predict whether a sheriff gets new military items on the joint basis of total material decommissioned combined with their distance to decommissioning centers. The Warwick-NHH paper uses the fact that some locations apply frequently for items, and others only infrequently. When military spending is high, there is a lot more excess to decommission. Therefore, an instrument combining overall military spending with previous local requests for “1033” items can serve as a first stage for predicted surplus items received. Despite the different local margins these two instruments imply, the findings in both papers are nearly identical. In places that get more military equipment, crime falls, particularly for crime that is easy to deter like carjacking or low-level drug crime. Citizen complaints, if anything, go down. Violence against police falls. And there is no increase in officer-caused deaths. In terms of magnitudes, the fall in crime is substantial given the cost: the Warwick-NHH paper finds the value of reduced crime, using standard metrics, is roughly 20 times the cost of the military equipment. Interestingly, places that get this equipment also hire fewer cops, suggesting some sort of substitutability between labor and capital in policing. The one negative finding, in the Tennessee paper, is that arrests for petty crimes appear to rise in a minor way. Both papers are very clear that these results don’t mean we should militarize all police departments, and both are clear that in places with poor community-police relations, militarization can surely inflame things further. But the pure empirical estimates, that militarization reduces crime without any objectively measured cost in terms of civic unhappiness, are quite mind-blowing in terms of changing my own priors. It is similar to the Doleac-Hansen result that “Ban the Box” leads to worse outcomes for black folks, for reasons that make perfect game theoretic sense; I couldn’t have imagined Ban the Box was a bad policy, but the evidence these serious researchers present is too compelling to ignore. So how are we to square these results with the well-known problems of police violence, and poor police-citizen relations, in the United States? Consider Roland Fryer’s recent paper on police violence and race, where essentially the big predictor of police violence is interacting with police, not individual characteristics. A unique feature of the US compared to other developed countries is that there really is more violent crime, hence police are rationally more worried about it, therefore people who interact with police are worried about violence from police. Policies that reduce the extent to which police and civilians interact in potentially dangerous settings reduce this cycle. You might argue – I certainly would – that policing is no more dangerous than, say, professional ocean fishing or taxicab driving, and you wouldn’t be wrong. But as long as the perception of a possibility of violence remains, things like military-grade vests or vehicles may help break the violence cycle. We shall see. The two AEJ: Policy papers are Policeman on the Frontline or a Soldier?” (V. Bove & E. Gavrilova) and Peacekeeping Force: Effects of Providing Tactical Equipment to Local Law Enforcement (M. C. Harris, J. S. Park, D. J. Bruce and M. N. Murray). I am glad to see that the former paper, particularly, cites heavily from the criminology literature. Economics has a reputation in the social sciences both for producing unbiased research (as these two papers, and the Fryer paper, demonstrate) and for refusing to acknowledge quality work done in the sister social sciences, so I am particularly glad to see the latter problem avoided in this case!